Monaghan, a new Chelsea boot for women, from Dubarry&apos;s iconic leather country boot collection, incorporates GORE-TEX technology and is crafted from Dubarry&apos;s signature DryFast-DrySoft„ leathers. With buckle trim and elasticated side gussets for easy entry, Monaghan boasts a durable rubber and leather hand-built sole unit with 2.5 cm leather stacked heel. Ideal city style, Monaghan also looks great as country attire. A sophisticated finishing touch to your Dubarry clothing collection; perfect with tweed, women&apos;s quilted jackets, ladies&apos; gilets and women&apos;s knitwear. 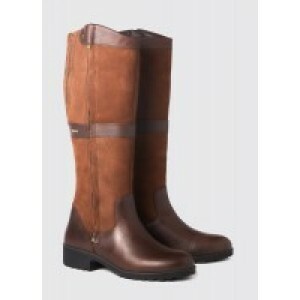 • Dubarry&apos;s signature DrySoft-DryFast„ leathers. 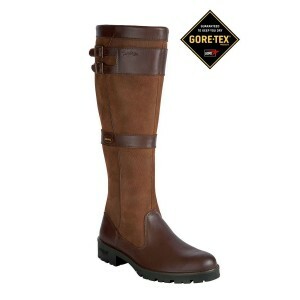 • High performance GORE-TEX® technology.